It is widely known, and can be found on many major medical web sites, that high LDL cholesterol causes he art disease. However, this is false. There is abundant research available today confirming that this is false, but the notion persists. Small LDL particle size is associated with heart disease; so is homocysteine, CRP, high insulin, high glycated-proteins, A1c is an example, high Lp(a), immature HDL particles, high iron stores and more. The list of things associated with developing heart disease is long and none of them are dispositive. As a kind of fun fact, know that low cholesterol is associated with everything from depression to cancer. Lots of excuses for this association are made by the statin apologists but no one actually knows what the link between low cholesterol and these other diseases might be. American medicine has been on a veritable cholesterol-lowering crusade going on 40 years. 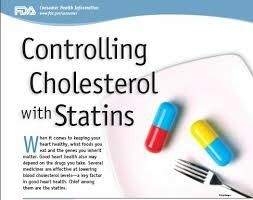 People were told to eat low cholesterol food, and take cholesterol-lowering drugs, specifically statins. Knowing, as I do, how the body tends to optimize toward healing disease, I was always suspicious of this. Everything else being equal if the body would be better off with lower cholesterol, that’s where it would already be – no pill needed. In fact, in 2002, the drug industry came up with a statin substitute, that only lowered cholesterol, called ezetimibe (Zetia, Vytorin). It was specifically developed so that people that could not tolerate statins, could still lower their evil cholesterol. However, exetimibe, if used alone, not only failed to prevent heart attacks, it significantly increased cancer. This dramatic medical misfire was apparently not enough to get the FDA to pull the drug; it’s still available and widely prescribed. So, whatever the merits of lowering cholesterol as evidenced by statins lowering cholesterol, it was not as simple as ‘lower cholesterol and everything will be fine.’ The failure of this drug should have put the simple ‘lipid hypothesis’ to rest. By the way ‘the lipid hypothesis’ is the generic term for the whole cholesterol model of disease. “BUT, BUT, BUT, statins reduce heart ‘events’. There’s surely a benefit.” This is true, but who benefits? If you consider ‘all cause mortality’, rather than considering just heart events, the picture is not so sanguine. No category of women, with or without pre-existing heart disease is helped overall. For men with no pre-existing heart disease, no benefit either. For men over 80, no benefit. We have now ‘sliced and diced’ the benefit group down to “men, under 80, with pre-existing heart disease may get benefit from statins.” For that group, maybe. Even this is controversial. Not quite the wonder drug hoped for. More than that, there is an increase in non-heart related deaths. Hmmmm. Are there positive uses for statins? Yes. The most striking example, and the secret of its use revealed, is this: if atorvastatin is infused at the time of a coronary catheterization then there are fewer heart complications, including death, from the procedure. Now this immediate benefit is obviously not from lowering cholesterol. It is from calming ‘endothelial inflammation:’ the metabolic fire in the lining of damaged arteries is dampened. This is a good thing. Congratulations statins! We know that unstable plaque, the damaged area of an artery, is the source of the clotting trigger that brings on a heart attack. We further know that inflammation is what destabilizes these areas of damage. Decrease the intimal inflammation and you get fewer heart attacks and bingo you also now know the real benefit of statins. However, are the 30,000,000 Americans currently taking statins receiving benefit? In almost all cases, the answer is ‘no benefit:’ by any measure no more than 1 or 2 per hundred and probably much less than that in most populations. Recent studies show 20% percent of statin users report side effects: 10% have muscle pain and damage, sometimes permanent, the rest are divided between liver damage, kidney damage, adult onset diabetes, cataracts, depression and memory loss. Summary: Statins are effectively proven to be of no benefit to most, if not all, segments of the population. There are some specific uses, and that’s that. Even though I question whether any of you would benefit from statin therapy, almost all of you could benefit from inflammation reduction. Do you need to address this? Quantitative Medicine can easily answer that one. C-Reactive Protein, or CRP, is a quite general inflammation marker, easily determined with a blood draw. Is yours high? If so, something is amiss. Could be heart disease. Could be allergy, genetics, cancer, a cold, or a lot of other things. However, you need to figure out the bad actors and reduce them to see if CRP goes down. Diet and exercise can play a strong role here. If you do reduce it, you reduce your heart attack risk enormously, far more than even the wildest dreams of the statin manufacturers. Do your own heavy lifting – don’t outsource it to statins. If some studies do point to the positive effects statins have on reducing mortality rates in people with Coronary Artery Disease and if that is the reason (mortality reduction) given for prescribing a statin, how does one find appropriate reason to drop the use of statins if that means going against the prescribing doctors orders? Simple, sound question. I am afraid no one, including me, will like the answer. Look, even in the studies that show benefit it is in the setting of a select group of people, in a tight control matrix. The results do not approach the known benefits of proper and intense exercise and we know from other studies such exercise results in injury in those on statins, so the painful conundrum ‘dammed if you do and dammed if you don’t’ arises. Early in the history of this class of drugs experimental signals in the data led researchers to think statins would protect against osteoporosis, cancer, Alzheimers and other forms of dementia and on-by-one these ‘signals’ have proven false; the drugs simply do not do all that early promise offered. Yet, the early promise is still often sold as the real thing. The cancer issue is the last to fall but recent studies have pretty much disproved even this weak signal. So…you will need to make a carefully informed decision and accept the uncertainties. Finally don’t trust us either. There is no dispositive single study that will give you the guidance you seek. Recent publications have proven that the decision algorithms used to make statin use recommendations widely over estimate real risk of vascular events like stroke and heart attack. I sell better diet, more effective exercise and Spiritual discipline; they sell drugs. Neither one will work unless you take your medicine so this isn’t just theory. I’m 62 years old and 14 months ago, a stent was forced on me by my former cardiologist (a subject for another post) and now I don’t trust doctors much. I was put on Lipitor and then Pravastatin, but both made my legs weak and tingle like I had neuropathy. I eat virtually no sugar and little carbs and I exercise and lift weights 5 days per week. I recently had an NMR profile completed on my lipids and the results put me in the moderate risk for CVD and my Lp(a) is 10. My HDL is 44, trigs are 83, LDL-C is 100. Total Chol is 160. How in the world my former cardiologist talked me into a heart cath is beyond me. So, here is my question: Is my Plan of Action one prescribed by anyone in the medical community? Everywhere I turn, from family doctor to cardiologists, they want me to take statins and when I tell them that I won’t, they don’t seem very happy. I read many of the studies on statins. They claimed to reduce LDL and prolong life but did not mention if there were life style changes. Like quiting smoking, eating healthier or if they started exercizing more. They seemed conditionaly bias to me.